With the advent of technology much has changed in our life. Be it entertainment, business, travel or communication we see a vast difference in how things work today in contrast to how it used to before. In this ever flourishing digital age, communication has progressed tremendously. Earlier, getting a landline number entailed a long procedure. Standing in line, reaching the counter, submission of official documents and finally waiting for more than half a year to receive the instrument with an active connection. Now getting a phone connection takes around 5 minutes. Therefore almost every person has a phone in their pocket. Communication has become powerful ,effective and within one’s reach. Today our phones have become an integral part of our day to day functioning. All essential tasks can now be carried out on a smartphone. High speed internet on these devices open a plethora of rich content to the masses. Several network providers in the country are coming up with cost effective plans every day enabling the common man to consume more data and make calls with low call rates. They are also investing in creating apps that gives the consumer maximum control. Earlier, at the end of every billing cycle, came a printed bill with all the details and the service provider literally set deadlines to pay off bills with cash, standing in a queue. Even telecom operators had to setup a huge network of resources to manage their customer base with minimum ROI. From large number of customer service centers, IVR systems to employing as much as over a 100 representatives to assist the customer even at an individual level. In those days the customers were heavily dependent on the Telecom operator. Much has changed with great progress. Thanks to the intervention of superior digital design in telecom, customers have adapted to a ‘Self Service model’. 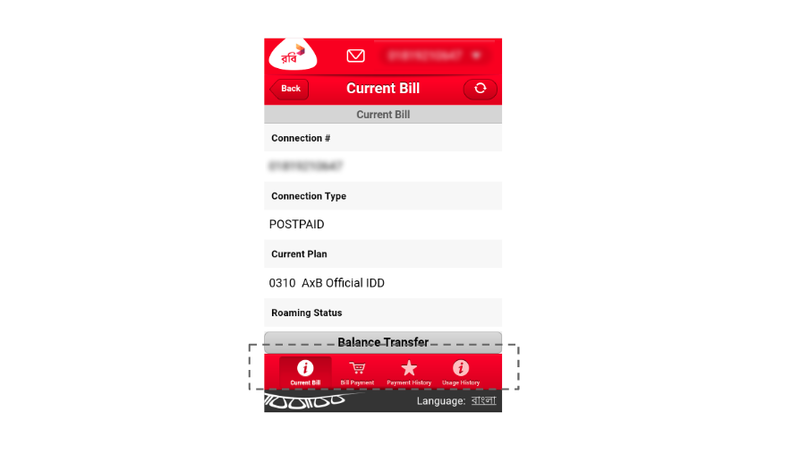 Now with the help of an application detailed information of the bill can be accessed and payment can be made online along with updating and changing customer details and tariff plans. This has also tremendously reduced the initial investments for telecom companies required for setting up large infrastructures. 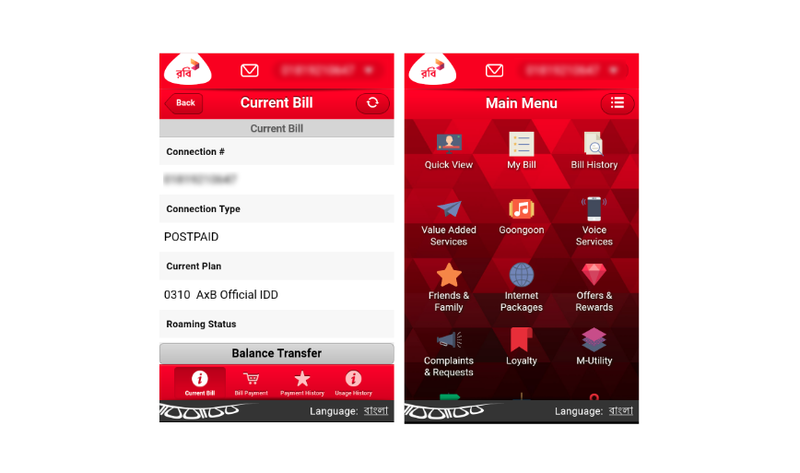 Several applications have been developed by network providers such as Airtel, Vodafone, Idea and Reliance Jio for consumers to keep a track and give them control of their network and usage. With such applications, service providers hand over decision making to the consumer. Everything is transparent. 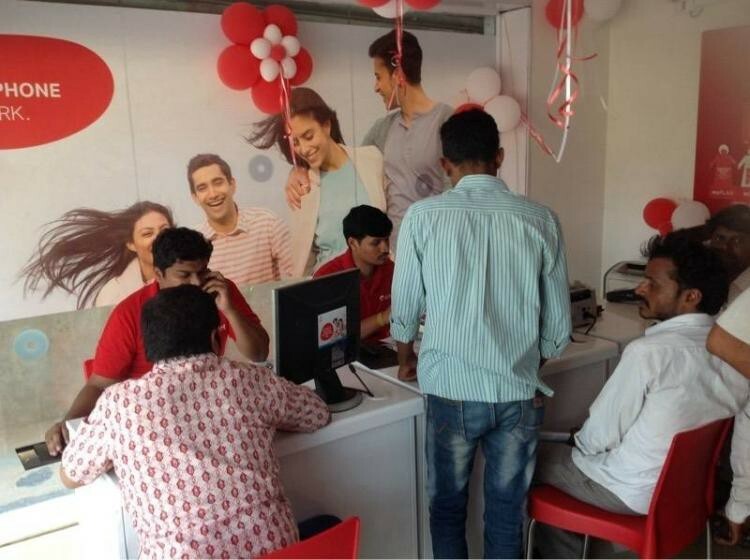 Recently, GDD got an opportunity to work with one such service provider from Bangladesh called Robi. 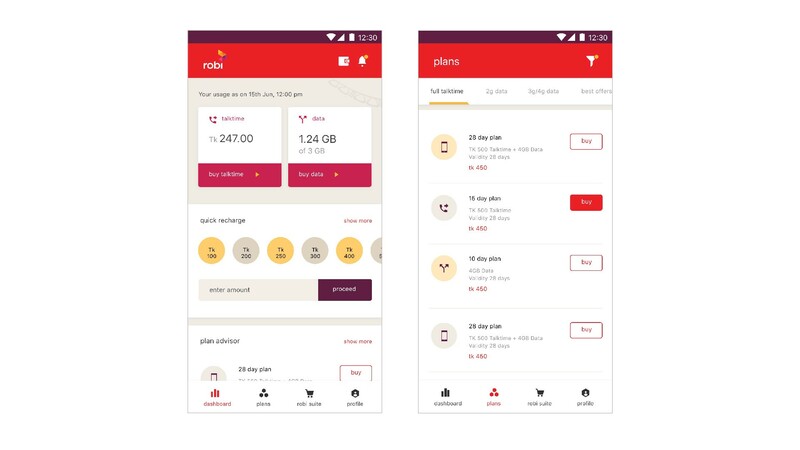 Robi is the most dynamic and fastest growing telecommunication network in Bangladesh serving more than half of the country’s population. However, the user experience of the application was not in place due to which it could not create an impact on the users leading to low downloads and overall unsatisfied customers. GDD wanted to explore how an improved UX can transform an otherwise unpopular product into an effective tool for its service provider to acquire and hold onto customers. 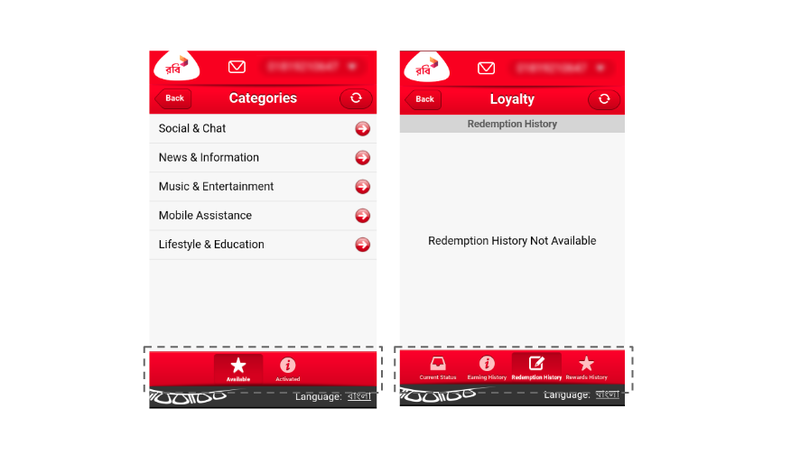 In an attempt to give Robi a fresh look ,we studied the product and tried to revive the ROBI experience. The application had poor navigation which in-turn rendered poor user experience. Having an undefined hierarchy hinders perception of the product thereby creating an unsatisfying experience. Lack of consistency makes it difficult for the users to get used to the product. This creates a larger learning curve for the users thereby amounting to higher bounce off rates. Improper communication leaves the user uninformed and perplexed. When elements are not in context in the application, the users do not feel in control. The overall visual language of the application was quite outdated. It was not good enough in comparison to the current international standards failing to create an impact on the vast user base. 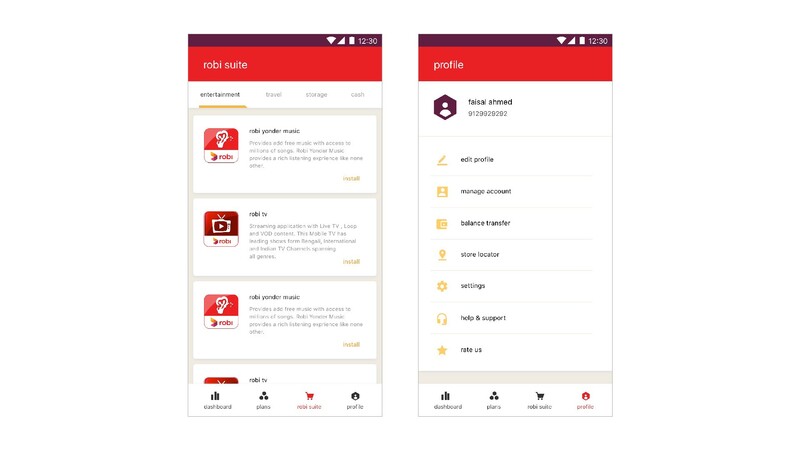 The approach was to retain the functionality of the application, but to optimize several elements to be more intuitive and useful for the users coming on-board to the application. Home Screen- the home screen is the first screen that users land on. This was given the treatment of a Dashboard. A Dashboard in its true sense gives users access to key information related to their account. Therefore the home-screen plays a much more important role now. 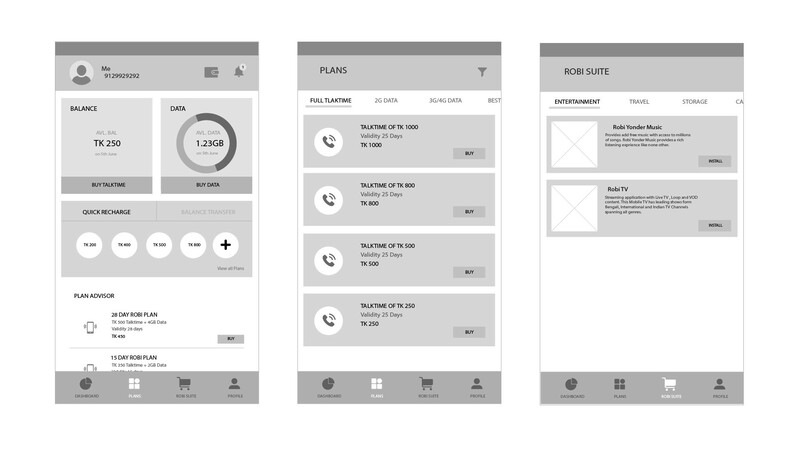 Plans Screen- Consumers are heavily dependent on mobile data packs and plans. Especially in Bangladesh it has been understood through research that majority of the population is dependent on packs that are tailored to their needs and offer great deals. This screen allow consumers to access the best packs available and purchase them. Suite Screen- showcases all the products under the Robi Umbrella giving a holistic view to consumers and expressing the grandeur. Visual Design of the application was approached keeping in mind the Brand Identity. 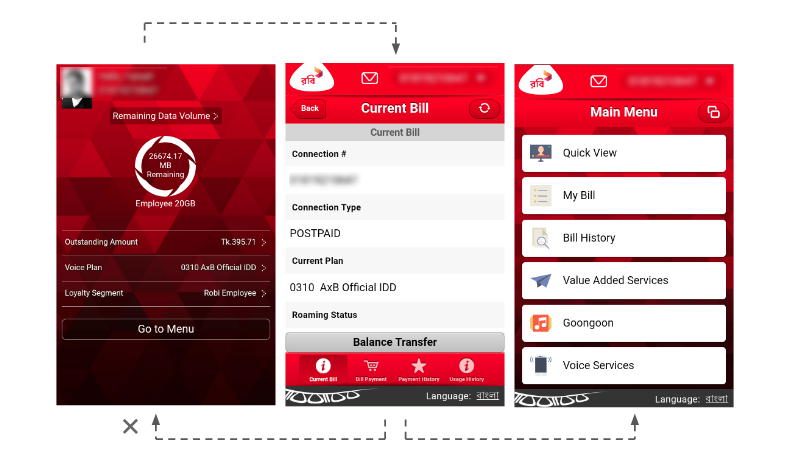 At the same time, we refined the visual outlook of the application to bring it to power with its current competitors. A brand so well established, should also have a great recall value to customers, thats what makes it really successful. Telecommunications plays an important role in the consumer market today. For example, Jio by Reliance Group in India has recently transformed its telecom sector. 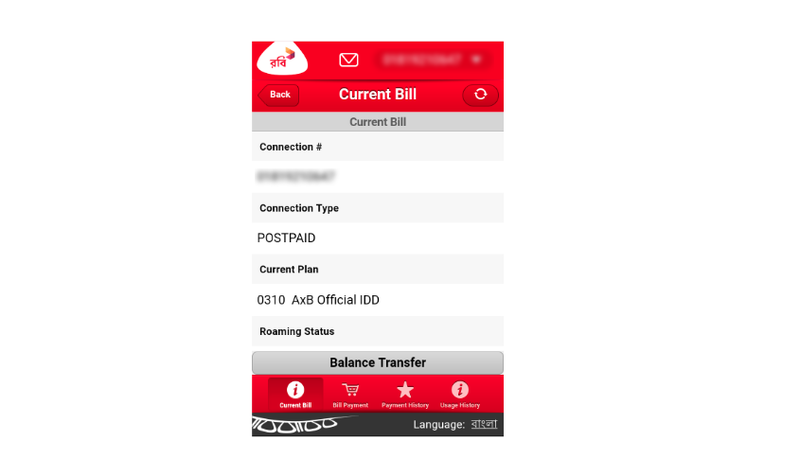 From taking a new sim card to managing your service plan and bill payment, telecommunication has become accessible to all segments of the society where data has taken over voice services. With faster internet speeds and better connectivity, all essential tasks are being carried out online. And a better, improved UX aids the service provider in bridging the gap with the consumer every day. Markets in South East Asia, specially Bangladesh has seen an ever increasing competition between the large players of the telecom industry in the country mainly, Grameenphone, Robi, Banglalink and Airtel where customer experience is being given highest priority in-order to not only acquire new customers to their network but also retain them by providing a seamless user experience as self service. In addition, these telecom companies are thereby able to minimize their initial cost substantially and increase their ROI with better experience driven products and services. 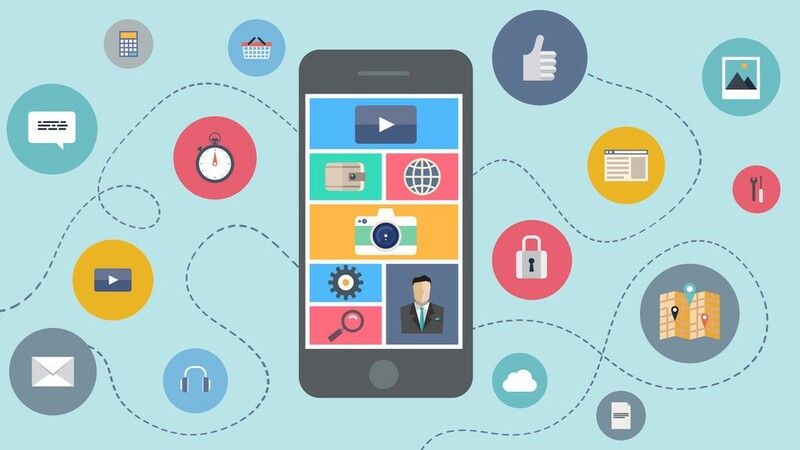 Everyone is focused on improving the UX of their respective apps which is indeed a very good news for the customer who is truly becoming “customer comes first”.